Iran’s Supreme Leader Ayatollah Khamenei said today that all sanctions must be lifted when the comprehensive nuclear deal (JCPOA) is signed. 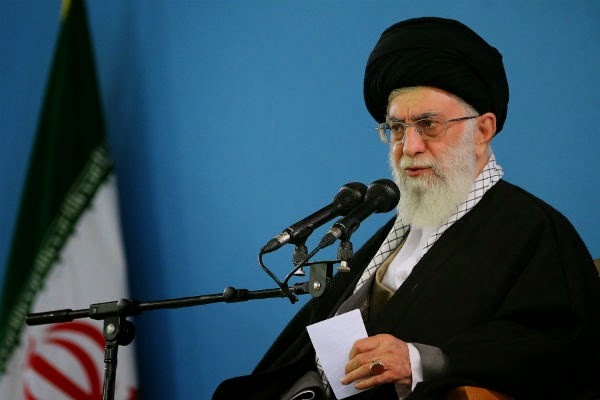 Khamenei also said that Iran’s military sites would be strictly off limits to IAEA inspectors. Khamenei’s remarks were the first on the framework agreement that was struck in Lausanne last week. During the announcement of the framework agreement in Lausanne, EU foreign policy chief Federica Mogherini and Iranian Foreign Minister Javad Zarif read a joint statement that indeed linked the lifting of sanctions to IAEA and UNSC processes. If Khamenei was referencing those processes, then this could constitute a step backward. “The EU will terminate the implementation of all nuclear-related economic and financial sanctions and the U.S. will cease the application of all nuclear-related economic and financial sanctions, simultaneously with the IAEA-verified implementation by Iran of its key nuclear commitments,” said Mogherini/Zarif statement. “A new UN Security Council Resolution will endorse the JCPOA, terminating all previous nuclear-related resolutions and incorporate certain restrictive measures for a mutually agreed period of time,” Mogherini/Zarif statement added. According to the joint statement, the EU/U.S. sanctions are lifted/not applied after IAEA certifies Iran’s compliance with the agreement, which could be days or months after the day the agreement is signed. Meanwhile, the UNSC would put “certain restrictive measure,” which could include issues related to Iran’s ballistic missile program. The new UNSCR will not be put to a vote on the day the agreement is signed. There is a serious discrepancy between Ayatollah Khamenei's understanding of the terms of the agreement and what the joint statement by Mogherini and Zarif said. The two sides will now need to iron out their different interpretations of what was agreed to in Lausanne prior to the signing of JCPOA. Nothing goes easy with these talks! UPDATE: The State Department said Thursday the sanctions would be removed only gradually. - Enrich enough uranium to produce fuel rods for even Bushehr reactor. - Not allowed to inject UF6 gas to our enhanced IR5 and higher generation centrifuges. - Not allowed to have fuel processing plant (We will be using lead to simulate fuel production in the existing plant and we will not be allowed to have consumed fuel processing plant). - Not allowed to have heavy water reactor (Heart of the reactor will be destroyed replaced by some unidentified thing). - Not allowed to keep our already enriched uraniem. Then the question is what will we be achieving with regard to our nuclear energy program and already constructed facilities upon accepting this agreement but making ourselves a passive and subdued nation. If this is the case wouldn't it be better not to have this from the beginning and bring upon ourselves all these cost and difficulties? ANKARA: Failure to finalize a framework agreement between Iran and the six major powers aimed at curbing the country’s sensitive nuclear work could profoundly destabilize the Islamic Republic, analysts and politicians say. Iranians’ hopes of ending their international isolation have risen so high since the accord that failure to finalize it would generate levels of dismay that could hurt the authorities, even if the West was portrayed as the guilty party, analysts say. “Finally it is over. The isolation is over. The economic hardship is over. [President Hassan] Rouhani kept his promises,” said university student Mina Derakhshande, who was among a cheering crowd Friday. Managing popular expectations will be more difficult in Iran now, said Karim Sadjadpour, an Iran expert at the Carnegie Endowment for International Peace in Washington. “If the deal doesn’t come to fruition, most Americans won’t notice, while most Iranians will be devastated,” Sadjadpour said. Good and very "deep" message to those who thought they had bullied the Iranians by giving the negotiation team some empty promises... just to ensure the other side understands Iran might make a u-turn on a size of a coin if necessary and go with full speed in the other direction...this time having both China and most importantly Russia (which is already under sanction) on its side...hopefully the big powers take the provided window of opportunity seriously and stop the "cat and mouse" game....in order to avoid a July surprise. Zarif said earlier that nothing is agreed if something is not agreed. DM Deghan recently also stated that military aspects are not an issue to be governed by an (nuclear) agreement and inspections. And finally, an Iranian journalist who covered recent talks in Switzerland, and who staunchly supported Rouhani during last years, defected to the West by asking for asylum in Switzerland. Are they somehow inconvenient for "students"....... to learn ?? So neither parties are going back on their words. Now what?? anon 2:42pm of course! akhoond nuclear weapons programme was an exercise in futility! This regime says one thing but does entirely a different thing altogether. He warned the fish against taking itself on a hook. The ultimate objective of the west is a regime change in Iran. Even if we give up and surrender to all their demands they will follow their own agenda. Our surrender, just make it easier for them to achieve their goal. It is better to go full force and become a nuclear state, suffer under sanctions and survive like North Korea than become like Libya, Syria or Iraq. It is our pledge to our country to be free and independent and those nuclear scientists assassinated by the same people and died honourably for us not to accept humiliation of becoming subdued and scientific apartheid. There clearly is an impasse with regards to timing of cancellation of sanctions, but I do not think it is an impossible one. I think this ambiguity is build in so beach side can claim success without saving face. I would imagine US congress will have its say on the US sanctions which would be that it will design the framework on cancellation of US sanctions after a verification mechanism (they could have been allowed to expire by executive action). The UN security council resolutions are difficult because after the framework agreement Iran is still not complying with them regarding missile proliferation and arms exports specially to non state actors. Russia is keen on the economic US sanctions staying which limit oil and gas sector in Iran but would like the UNSC sanctions which ban arms exports to Iran being cancelled. Europe would like to leave some arms duel use technology export bans and feels these sanctions need to be UNSC as there is no technology gap between Russia and china and the west. There are signs that Mr Khamenei understands the nuances of these positions and now clearly realizes that Russia and China are playing their own game. Iran really needs to get the best deal they can get and stop aiming for the perfect deal. Mandarins in the West who are benefiting from the vacuum left by Iran on the global trade are fuming at every positive development on the negotiations . China + Russia have earned big money on Iran sanctions. Furthermore Turkey has done the same thing not talking about the UAE. Imagine the day the sanctions are lifted,,, these countries will in a sudden lose their unique status instantly! The only manderins in the west who are benefiting are the IRI cheerleaders who earn a nice living by spreading propaganda over the internet. Actually in the same speech Khamenei took a swipe at Saudi Arabia by mocking their thread to start their own nuclear program . Quote "Mr Khamenei derided those threats, challenging Riyadh to follow through on its ultimatum. "Some backward country says if Iran has enrichment we will enrich too. so go ahead and enrich", he said. Now any pretext for a war against the Islamic Republic, based on nuclear weapons pursuit, has no too strong credibility, but after a signing of 'something', Russia and China will have less options to disobey those petexts against the IRI, especially when the UN 'inspectors' will conduct their actions like during the Saddam Hussein's case and follow suggestions of their 'masters'. Do you have the link for the speech? We are witnessing epic events, which show how important is a strong leadership. The Supreme Leader, by his smart guidance is again influencing and riversing a drifting situation of events, which are crucial to the existence of Islamic Republic. Importance of His statement that sanctions must be lifted on the day when the nuclear agreement is signed, can be compared to his epic intervention when He defended, during His speech, results of the 2009 election, and prevented enemies from achieving their goals. Yesterday I listened to the D. Rinn's radio program, where some participants "consoled" themselves that Rouhani said; something different than the SL, "that sanctions should be lifted on the day when an agreement will be "implemented". That shows that one of the goals of negotiations with Iran was to sow a rift between Iranian negotiators and other religious and political entities of the Islamic Republic, and at the end blame "Iranian hardliners" for inflicting hardship on Iranian population, by their refusal for an agreement. P.S.I apologize for previous lack of my replies to our communications, and I believe that my replies were blocked as it happens when someone questioned my comment (where his intention was a rhetorical one ?) and my reply was not posted in numerous cases. A-F, you probably have published more comments on this blog than any other reader I know! Unfortunately your comments above manifests a lack of honesty on your part. We do not publish comments that have basically nothing to do with the subject of the posts and/or are personal attacks on the authors or other commentators, as has been with few of your comments, and I have discussed this with you openly on these comment sections. We have no problem with anyone expressing different views on any particular subjects, including the supreme leader of Iran. In fact we welcome robust discussions on current events in Iran and the region, the events you have described as epic here, and I agree. Any such robust discussion requires that different points of view be represented. There never was a nuclear weapons program in Iran? So you're saying all those ballistic missiles are for delivering roses? Iran has just one nuclear reactor built by the Russians and they supply all the uranium required for it. So why all the enrichment by the Islamic regime when there is no other reactors in exsistence? Simple answer. A weapons program. But you're welcome to continue to believe your own press.